Please feel free to download the slides. 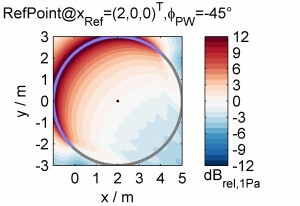 Wave Field Synthesis (WFS) is a well-established sound field synthesis (SFS) technique that uses a dense spatial distribution of loudspeakers arranged around an extended listening area. It has been shown that WFS based on the Neumann Rayleigh integral constitutes the high-frequency and/or farfield approximation of the explicit SFS solution, such as the Spectral Division Method (SDM) and Nearfield Compensated Higher-Order Ambisonics (NFC-HOA). However, for SFS of a virtual plane wave using a linear loudspeaker array a supposed mismatch between the SDM and a WFS driving function has been reported in literature. In this paper we will derive the WFS plane wave driving functions using the same stationary phase approximation approach as introduced for the virtual non-focused point source. This yields WFS driving functions either for a reference point or for a parallel reference line. It is shown that the latter is identical with the high-frequency and/or farfield approximated SDM solution. Thus, with no mismatch existing, the SFS fundamentals are proven to be consistent. This entry was posted in Papers. Bookmark the permalink.